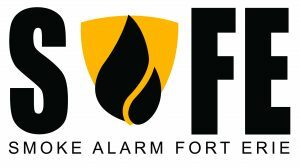 MEDIA RELEASE (April 2, 2018) Starting April 7, Fort Erie firefighters will be going door-to-door on advertised nights and weekends throughout the year as part of its new SAFE (Smoke Alarms Fort Erie) program. The SAFE program is designed to increase awareness about the importance of working smoke and carbon monoxide alarms. In Ontario, every home must have a working smoke alarm on every storey and a carbon monoxide alarm outside all sleeping areas in homes that have an attached garage or fuel burning appliance. “Using the three pillars of Fire Prevention, our job starts with education, followed by prevention and finally with suppression. If we are able to not only educate but also motivate our residents to use fire safety best practices in their everyday lives, we will be able to minimize the number of fire casualties we see in our Town,” said Fire Chief Ed Melanson. Throughout the winter, the entire fire department underwent training to carry out the new SAFE intensive door-to-door program. The program includes in-home inspections to educate and promote fire safety; testing and maintenance of smoke and carbon monoxide alarms; and, providing literature on home escape planning and safe cooking practices. “When we come to your home, we will be offering a total amnesty. We will check your home and make sure that the alarms are compliant with the law. If for some reason, there is a problem, we will help fix the problem where we can or provide the homeowners with the tools they will need to fix the problem themselves,” said, Fire Chief Ed Melanson. For more information about the SAFE program, please contact Colleen Bandy at cbandy@forterie.ca or 905-871-1600, ext. 2601.